Cheesecake is one of the easiest desserts to transform to a low carb, gluten-free, keto, or Trim Healthy Mama eating plan. 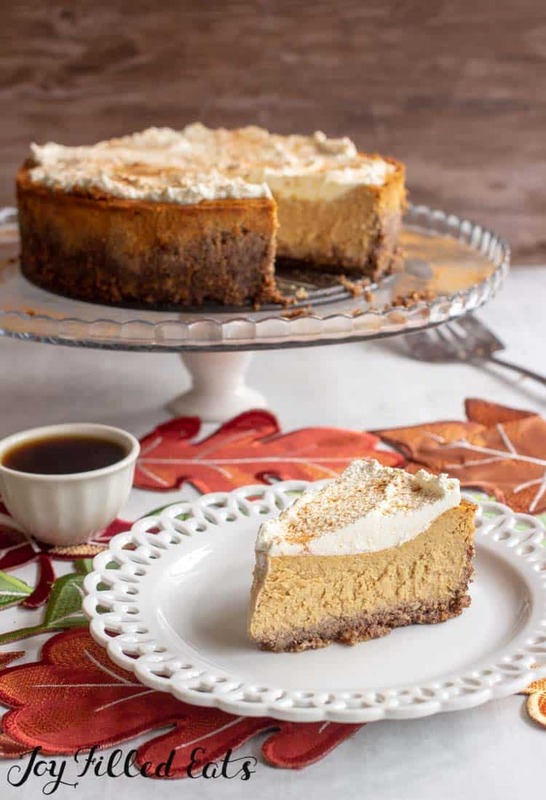 Win over your friends and family this fall with my easy Pumpkin Cheesecake recipe. The first time I ever did an official diet was about 9 months into being married. My husband and I had settled into married life and each put on a few pounds enjoying life. We decided to do the South Beach Diet together. We bought the book and dove in. One of my favorite desserts on that plan was the mini sweetened ricotta cheese desserts. They taste like cheesecake. That was one of the easiest ways to satisfy my sweet tooth and not feel like I was missing out. Over the years I modified those into true cheesecakes and have a handful of amazing cheesecakes in my repertoire. Some of my favorites are my mini breakfast cheesecakes. I use a hearty amount of cottage cheese to boost the protein and make them suitable for breakfast. 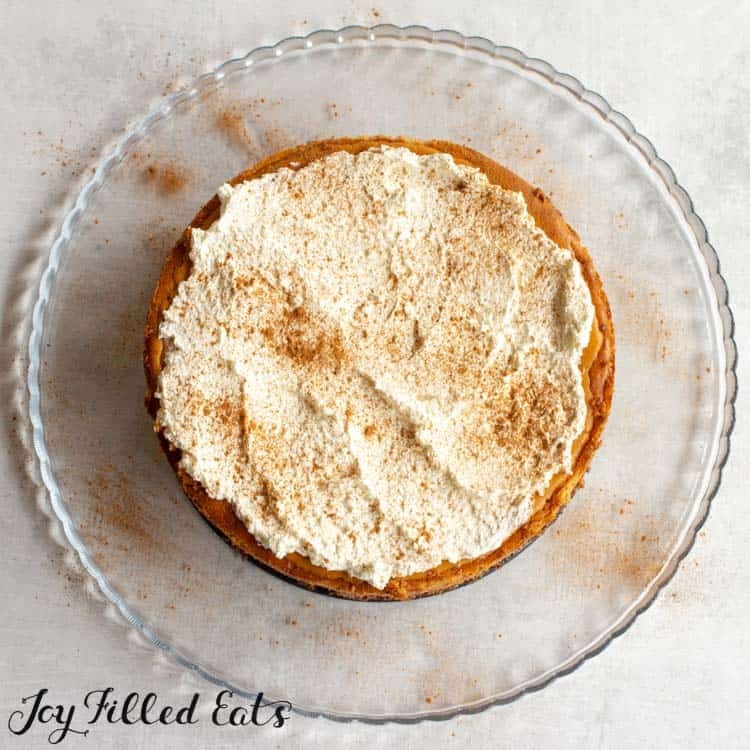 I adapted my mini pumpkin breakfast cheesecake into this recipe. I’ve made dozens of cheesecake recipes before I started making my own up. I’ve done water baths, instant pot cheesecakes, and used a variety of ingredients. Over the years I’ve come up with an easy method that works for me every time. Step 1: Make the crust in the food processor. Step 2: Make the filling in the food processor without washing it. A few specks of chopped nuts in the filling won’t make a difference. Go easy and save yourself the trouble of washing the bowl. Step 3: Just wrap the springform in foil and skip the water bath. Testing cheesecakes with and without a water bath I haven’t noticed a difference. They are delicious and creamy either way. Skip the trouble and possibility of a soggy crust. My favorite healthy crust for a cheesecake is a nut crust. 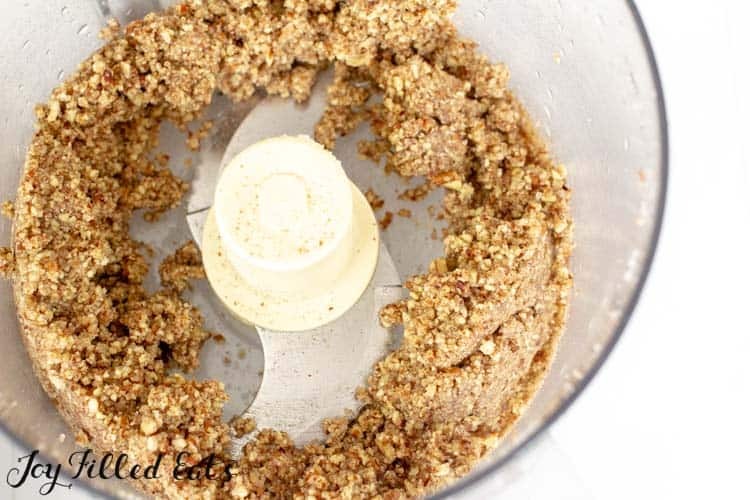 It is quick and simple to chop nuts in a food processor with some butter and sweetener and use that for a crust. It happens. Don’t fret. A cracked cheesecake is the best excuse to make a pile of whipped cream and slather it on top. I’ve heard a rumor that to avoid the cheesecake cracking don’t open the oven. I’ve never been able to try that. I have to peek. And jiggle my cheesecakes to see if they set. So sometimes they crack. And then I either top with whipped cream or a sour cream topping and no one ever notices. 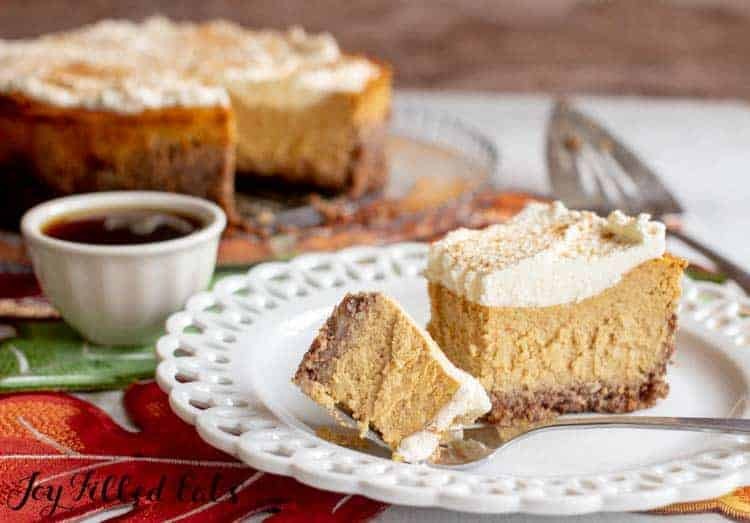 I hope you enjoy your fall with this Pumpkin Cheesecake! 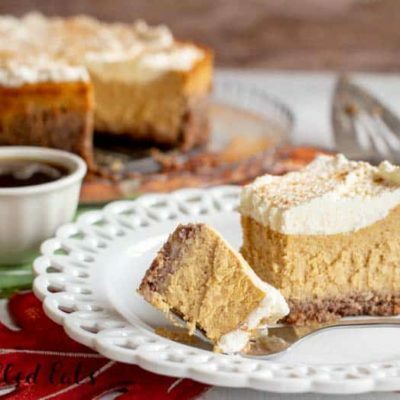 This pumpkin cheesecake comes together in minutes in your food processor or blender. With less than 10 ingredients and about 10 minutes of prep time, you can have a delicious fall dessert. 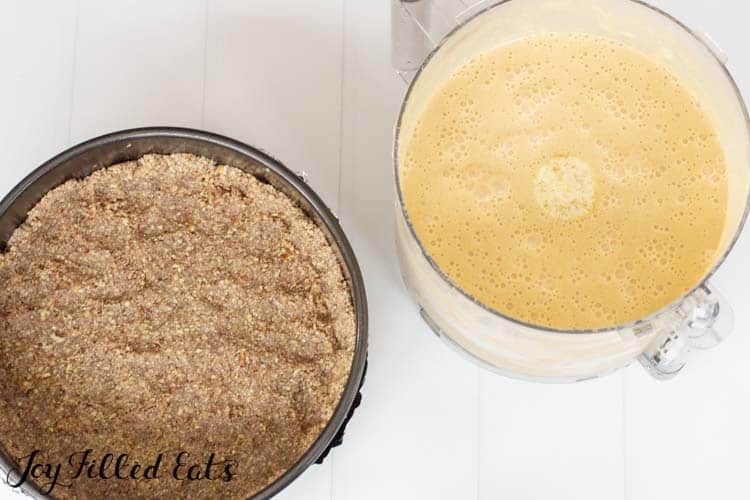 Add the crust ingredients to a food processor or blender. Pulse until the nuts are finely chopped. Press into the bottom and 1/2 inch up the sides of a 9-inch springform pan. Bake for 10 minutes. Meanwhile, in the same food processor or blender bowl (no need to wash) pulse the cream cheese and cottage cheese until smooth. Scrape down the sides as needed. Add the rest of the filling ingredients and blend until smooth. Pour the filling on top of the prepared crust. Bake for 1 hour to 1 hour 15 minutes or until the edges are golden brown and the center only jiggles slightly. Cool until room temperature. Refrigerate to chill for at least 3-4 hours. Whip cream until peaks form. Mix in sweetener, if using. Spread on the cooled cheesecake. Store in the refrigerator. 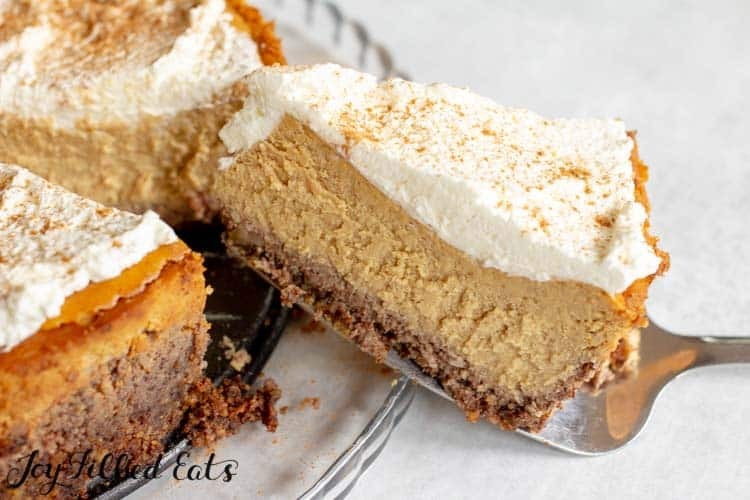 I have made this yummy Pumpkin cheesecakes soo many times now! It’s a family favorite! We are a full keto family and have been for a year and a half now! We make ours crust less to keep our carb levels lower! I also use pumpkin pie spice in ours and we love it! We have made so many of your recipes and you by far are our favorite and go to for yummy things to eat! I made this amazing recipe and it was scrumptious!! My family loves it. The only thing I changed was I cut the sweetener in half for filling and whipped topping. Question, the nutritional facts you have included are with or without the whipped cream? Thanks! With the whipped cream. Enjoy! This looks amazing! Just verifying before I make this that it really needs six eggs? I only have truvia as sweetener for the filling. How much would you suggest? Truvia measures the same as my sweetener so you can use the amount listed. Do you know how much monk fruit sweetener to use? 1.5 to 2 times the amount listed, assuming you are using a blend like lakanto. I’m not necessarily Keto just like This recipie for gluten-free option. If i used real sugar or stevia do you know the conversations? Thank you! You would need twice as much sugar. I'm not sure about stevia. Thanks for this recipe! I'm excited to make it next week for Thanksgiving! Unfortunately, I don't care for pecans. For the crust, may I sub 2 cups almonds, or better yet, use almond flour--and if so, how much? Yes. 2 cups should work. I have never made my own cheesecake before. When do you wrap the pan with foil? Also when do you remove from the spring pan? Thanks! Wrap the pan in foil at the very beginning before adding the crust. And then you remove the springform sides right before serving. It is easier to store in the fridge and/or travel with if the sides are on. Can we make this without the crust? You might need to half it for the smaller pan. But please lmk how it turns out in the instant pot! how much swerve would you use? 1.5 to 2 times the amount. It isn't as sweet as my sweetener. I only have Sukrin:1, and am trying to figure out the conversion. Would I use the same amount as your sweetner measurement for this recipe? No, you need more. My sweetener is twice as sweet as sugar. Sukrin is 1:1. Yes. I wanted to keep the ingredient list short. You can add any of those you choose. Sub in pumpkin spice or add 1/4 tsp nutmeg or ginger. I don't use pumpkin spice because I don't care for nutmeg. This is truly the best! It is a forgiving recipe... I used what I had on hand: 8 oz cream cheese, 8 oz sour cream, 1 cup cottage cheese, 1/2 cup plain green yogurt, and 1 1/2 cups canned pumpkin, and everything else as listed. For the sweetener I used Lakanto Monkfruit Golden, and ground it in the coffe grinder to make it powdery like confectioners sugar, and used two droppersful of vanilla creme Sweet Lead liquid stevia. I skipped the crust and used a 9x 13 glass baking dish. After cooling in fridge all night, I ate a plateful this morning, topped with homemade sugar and grain free granola (it had nuts, pumpkin seeds, Lakanto sugar free maple syrup, and is yummy.) I was out of whipped cream but didn’t even miss it! This looks amazing and I love the fact you made it lighter. Perfect for a family brunch. This is perfect & looks so yummy! Thank you! 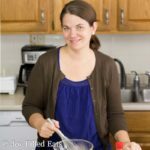 What could I substitute for the pecans since I need nut free? You could just leave them out. This also has almond flour... sunflower seed flour may work but I have not tested it. What size can is the pumpkin? We have two can sizes available at our grocer. Thank you. Yes! I've never had a cheesecake that didn't freeze well. 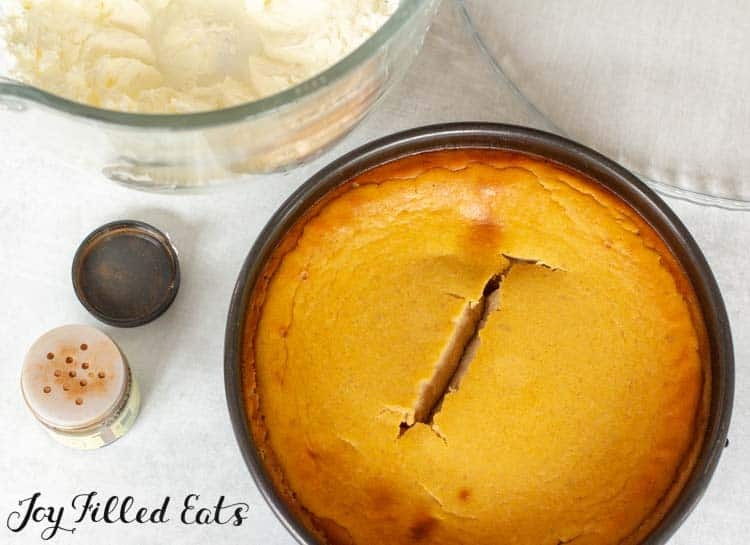 They are a great make ahead dessert. What can I sub for cottage cheese? Ricotta cheese or sour cream should work. But, you cannot taste the cottage cheese at all. It adds protein and lightens the filling. Nice! This is what I'm taking to Thanksgiving then! :) Thanks! Can I replace the cottage cheese with something else? I cannot stomach it! The recipe looks and sounds amazing though! Thank you. I promise you cannot taste it in the slightest! If you really want a sub sour cream or ricotta cheese should work. If you sub cottage cheese with ricotta or sour cream is it equal to recipe? Just checking about the one cup of sweetener in the filling. Is that correct?